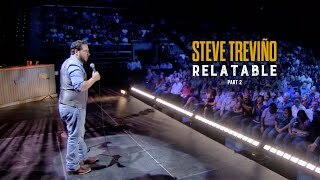 South Texas native Steve Treviño is fast becoming one of the country's hottest comics. Outside of being a national headliner, he's made memorable appearances on The Late Late Show, Comics Unleashed andBET Comic View, among others. Treviño's "Tex-Mex" style of comedy is a fresh voice for the 21st Century Mexican-American, earning him regular slots on Despierta America, Que Locos and The Latino Laugh Festival. He also wrote on Mind of Mencia and produced and wrote on rapper Pit Bull's La Esquina. Most recently Treviño landed in the Nielsen Top 20, with his Showtime comedy special, Grandpa Joe's Son.